On July 12 the City Council of Plattsburgh unanimously approved a resolution which calls upon the New York State legislature to rescind New York's law against breed profiling and once again permit breed specific dangerous dog laws. As a cost-cutting measure, the City of Plattsburgh eliminated its animal control staff. Subsequently, in response to two incidents this spring in which unrestrained dogs attacked other dogs--in one incident a dog owner who was protecting his dog was also bitten--Plattsburgh is now seeking to overturn a state law which has served New York for 10 years. New York State law on dangerous dogs is among the most comprehensive and strict in the country. 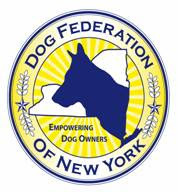 WHAT WE NEED: The Dog Federation of New York requests letters of opposition from every dog club, rescue group, law enforcement, working dog club in the State of New York. The text of the Plattsburgh Resolution, plus information on how to oppose it, can be found at Dog Friendly Plattsburgh . PLEASE do not send model ordinances, alternatives, substitutions, "at risk dangerous dog models", "give backs" or anything that in any way limits or restricts dog ownership. Many, many thanks for your cooperation and support!